When we see Epargyreus clarus in April or June or early October we hardly give them a second look. So here there and everywhere in southwestern Pennsylvania, our brain is conditioned to disregard that bold white spot seen on the lower surface of the hindwings. No, we pass them by, because we are looking for other butterflies, perhaps those less common, or more strikingly beautiful. Surely visitors to wingedbeauty.com haven’t come here to re-see such an everyday, mundane Lep! Well, we’ve now passed the middle of October in the year 2013, and we can hardly expect to see more than 2 or 3 Silver-spotted skippers in the coming week or two. Then we won’t see them again here until? April? March? Either way that’s 5-6 months away. More than 150 days without any chance of spotting these pedestrian butterflies. That said, let’s look again at these 2. Surely they are female and male. You can determine the story-line for yourself. She appears to be nectaring on Teasel (see our post of this American wildflower, that was not so American when it landed on our shores some hundreds of years ago presumably from Europe). 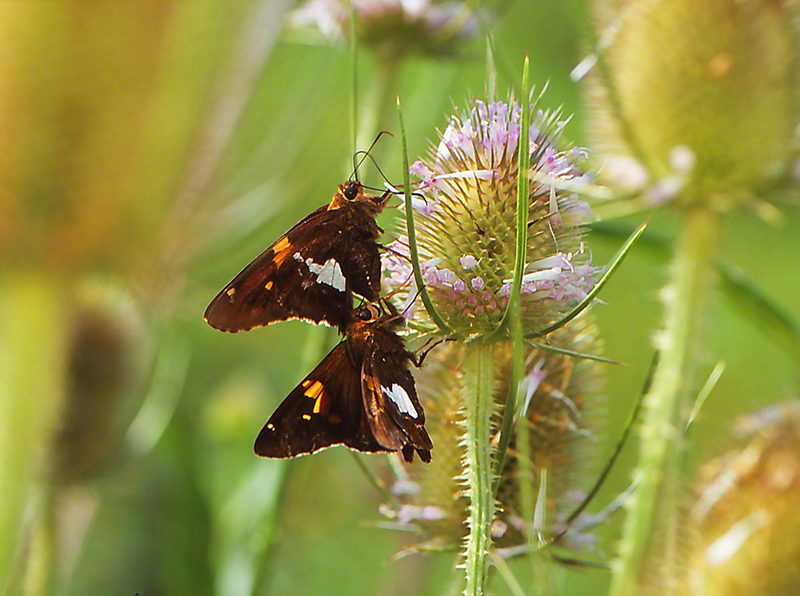 Handsome browns, flashy white patches, swift fliers, earnest nectarers on a great variety of flowers: they are the greeters who meet you as you travel the trails of your dreams. They are the butterflies that catch your eye when too many minutes go by and you haven’t found any, any other butterflies. It’ll feel like ages until we see this romantic view again. Oh yes, you’re viewing Raccoon Creek State Park. You will note that dozens of our posts were shot there. It is an excellent Pennsylvania state park for encountering butterflies. Excellent.